Dorotheanthus – guest from Africa, glass grass, varieties, growing, reproduction, care, photo and video. 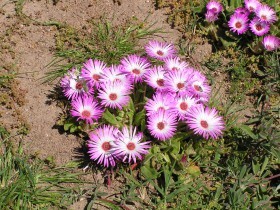 Unpronounceable name of "mesembryanthemum" is a rare flower, about which I know nothing, even the many seasoned gardeners. The same, who chose it for planting in your garden, will forever be a fan of his. Wonderful decorative properties flowers, but the leaves of the plant. A guest from hot Africa you can use, as povorotny earth will quickly tighten the makeshift carpet of dense leaves growths, like drops of dew. The plant tolerates sun and partial shade. 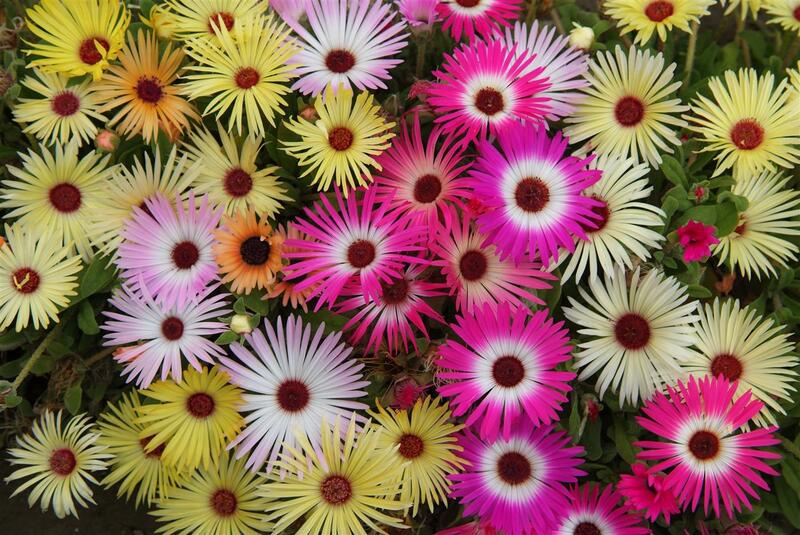 The foliage thickened mesembryanthemum, dense, fleshy, branching at growth, spreading on the surface of the earth. The plant is commonly called glass or ice, crystal grass. 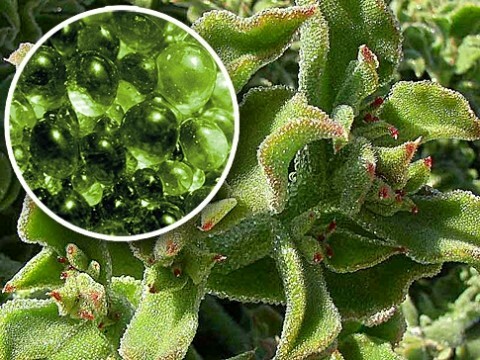 This is due to the fact, the growths on the leaves like drops of water and small pieces of glass or ice crystals. The present name translates, as the "midday flower" – bright blossoms have a tendency to open only in Sunny weather, the buds are closed in bad weather and in the evening. “Drops” on the leaves, who gave the second name – crystal grass. 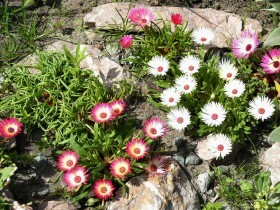 Kind of mesembryanthemum, dorotheanthus, translated, as the "flower, God". Nerd, Svantes gave this name in honor of his mother, bearing the name Dorothea. The plant really looks very unusual, it is often used in landscape design, the flowers are quite large – up to 4 cm in diameter, color – varied: white and purple, Burgundy and orange, pink and bright red. Interesting bi-color varieties. 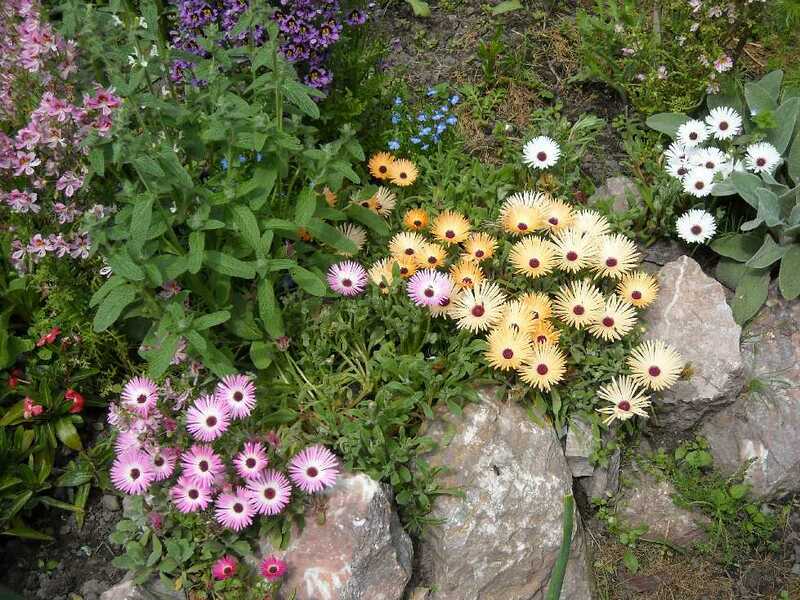 Graceful and bright "daisies" dorotheanthus margaritavile universal – they emphasize the shape of the border of the garden path, create beautiful flower bed. Planted "spots" the plant on the carpeted landing will delight the gardener and guests from mid-summer. Dorotheanthus interesting in combination with such different cultures, as the luxurious roses or the sweet and simple chimes. 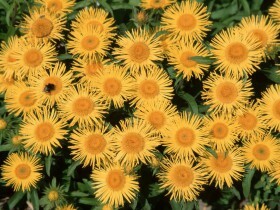 "Everybody" – the flowers are lemon-yellow and with red at the center. "Lemon soda" – the name justifies color: floral "lemonade" can be of all shades: from orange to yellow. "Magik karpet Mixed and Sparkles" – "glass" colored grass, forming extensive carpet landing. Modern breeders have selected varieties, having a distinct advantage – horticultural crops are not closed even in the most gloomy day. Photophilous plant is better positioned on the southern slopes of the site near dry retaining walls. At home the most beautiful varieties of plants grow well on dry sandy soils. 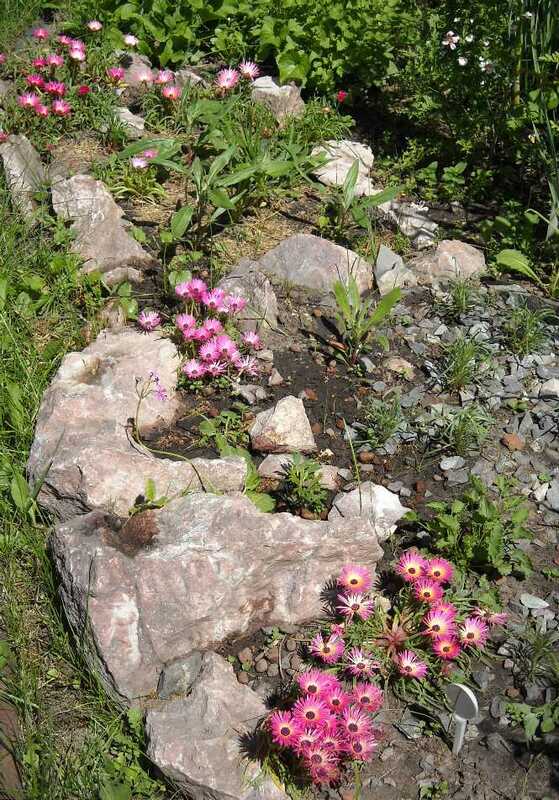 The Alpine slide with the plant, planted as the "first violin", it is possible to make the Central composition in the garden. Fantastically bright colors against the gray stones of any size and shapes attract the eye. By the same token, the plot is possible to break a rocky garden of their large pebbles, granite slabs, boulders. Dorotheanthus in such circumstances seems self-sufficient, but if desired it can be combined with other plants. 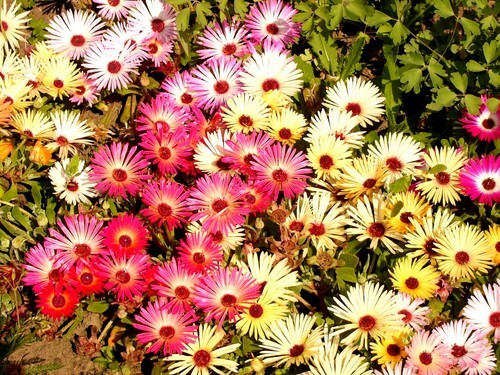 African Daisy does not require frequent watering. Under the leaves it is better to put gravel, gravel or small pebbles – they will protect dorotheanthus from the damp earth. 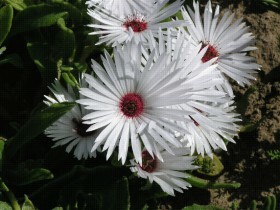 Flowering plant to the cold weather, but without daisies decorative function successfully carrying leaves. Glass the grass is good in small containers. To the composition was lush, in pots you need to plant a few plants. Vases with dorotheanthus can be put on the terrace, the veranda, at the entrance to the gazebo. Shoots close-set plants rapidly intertwine and form a natural carpet with bright and colorful flowers. Dorotheanthus will take the "baton" from the faded bulbs and bulbotuberiferous and decorate the area to the cold weather. You can build a luxury as a bed of plants of one species, and colorful. Luxurious floral carpet of colorful plants. The universal nature of the plant allows to use it as a decorative element in any area of the site. Dorotheanthus will decorate the shore of an artificial pond, hide unsightly fence from mesh-netting. At home dorotheanthus used in food, it is not dangerous for young children, pulling in the mouth all the pot. The plant can be placed near the Playground. 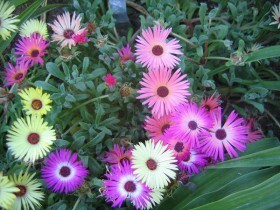 Some types of mesembryanthemum are grown in the middle latitudes as perennials, some of them as annuals. Dorotheanthus – annual plant, good growing, do not require special care and are not afraid of the cold. During the first short frost glass grass cover spunbond. The fruit of the plant is a box with a huge number of very small seeds, which remain viable for two years. 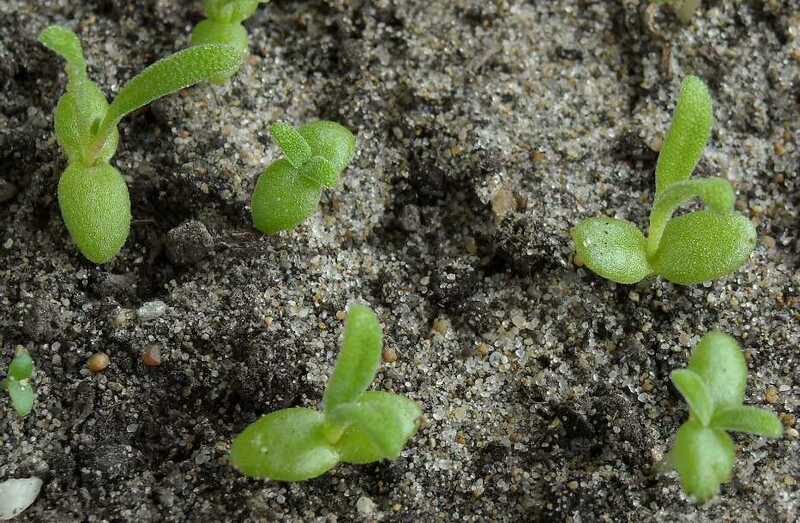 The best time of sowing for seedlings – late March, dorotheanthus can be sown directly into the ground. And, and in another case the young plants planted in a permanent place in late may. When the air temperature +18 degrees sprouts should appear within three weeks. After two weeks, the temperature should be lowered to +10, placing the boxes in a light place. Stagnant water can be fatal, watering to produce small doses. The seedlings have a hard time with picks, it makes sense to plant several seeds together, not buried, for this purpose are also well suited peat pots. Seedlings in such "containers" are planted in the ground at a distance 20 cm from each other. For proper development of the plant dorotheanthus suitable complex fertilizers. Feeding is done once in two weeks, this is especially important in the spring, at the time of greatest growth and development. 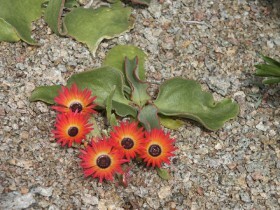 Dorotheanthus may suffer from excess of moisture or lack of lighting, but to pests and diseases the plant is resistant. Troubles are quickly eliminated with appropriate drugs, purchased for other flowering crops. White and dichroic dorotheanthus on the rocks. All content on this site SamDizajner.ru written specifically for Simdesigner, copying 1 in 1 strictly prohibited. Reprint, full or partial rewriting of the article “Crystal grass – dorotheanthus”, possible, only when you specify the full, active link to the source.